If your AC has reached its maximum lifespan and your need to buy a new one, you should contact Result Home Services. We provide a variety of HVAC services including air conditioning replacement and central air conditioner installation. Our highly qualified and knowledgeable service techs offer these services to residential and commercial properties. Our customers count on us to provide excellent service at prices that they can afford. We also offer free second opinions on HVAC estimates. Second opinions are also great if you want to be sure that the HVAC tech from another company inspected your system correctly. To speak with one of our home comfort specialist today or to schedule a free estimate, give us a call. When the warm weather is approaching, it is important that the homeowner has their air conditioning units checked out. It is important that the AC is running properly throughout the hot summer weather. There are plenty of homeowners who don't know what type of refrigerant their unit uses. Over the years, the HVAC industry has changed the acceptable refrigerant. Some of the refrigerant used in air conditioners today are toxic and not good for the environment. Most of the older air conditioning units use R-22 refrigerant. Unfortunately, this is toxic, and it is harmful to the ozone layer. Due to these dangers, the Environmental Protection Agency has placed regulations that will phase out R-22 gradually. Below, you get some critical information to help you figure out what type of refrigerant your air conditioner uses. We will also discuss your options if your unit is an R-22 model. 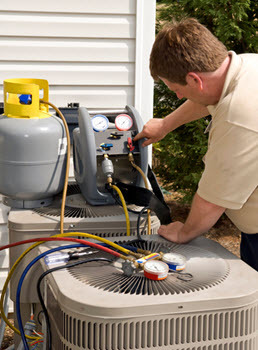 It is essential that you check what type of refrigerant your AC system uses. To do this, you should look at the manufacturer's label located on your unit's outside compressor. If your AC is a newer model, it should read R410-A refrigerant. Older models might read R-22. If your system uses R-22 and it begins to malfunction, you will need to decide if it is worth repairing or if you would be better off replacing it with a newer model. One issue that would require you to make this decision is if the refrigerant is leaking. Why Is R-22 So Bad? The HVAC industry has been using R-22 coolant for years. 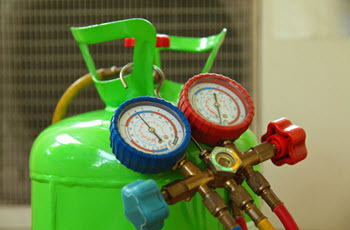 Air conditioners and heat pumps often use this refrigerant. In 1987, the U.S Government began lobbying for the reduction of all hydrochlorofluorocarbon (HCFC) products. These products are toxic, they emit greenhouse gases, and they are harmful to the ozone layer. R-22 is an HCFC product. Therefore, the production of R-22 is obsolete. Today, it is more expensive for HVAC companies to purchase R-22 to make the necessary repairs for refrigerant leaks. Eventually, R-22 won't be available at all. Experts claim that supplies will be extremely limited. This reason is why it can be so expensive to fix a refrigerant leak. In some cases, the cost of the repair is so expensive that it might be better to replace the system. Most reputable HVAC companies today recommend that people who have older units replace them with newer ones. Older R-22 models can have minor problems, such as a small crack, that will let the homeowner know that their air conditioner is reaching the end of its lifespan. If you are having an issue with your older AC unit, you should consider the cost of repairing it. You should also think about the fact that soon, R-22 won't be available. Because of this, the time will come where an HVAC contractor will not have the ability to repair your unit. Therefore, in most cases, it makes more financial sense to put your money toward buying a new AC rather than fixing your old one. Even if you find that the cost of replacing your old unit is high, eventually, it will be inevitable due to the fact the R-22 is being phased out. If you replace your AC unit, there are plenty of advantages. First, newer models are better for the environment. Also, modern air conditioners are more energy efficient than older ones. When you replace your old unit, it will reduce your energy costs during the summer. Finally, newer units will make the home more comfortable during the summer, and a new AC system will be more reliable. If your heater is old and about to reach its maximum lifespan as well, you should consider replacing your heater and your AC. You can buy them as a combo package, which is cheaper than replacing them separately. At Result Home Services, we provide HVAC services for residential and commercial customers. When you work with us, you can be sure that you are getting excellent service at the most competitive prices around. 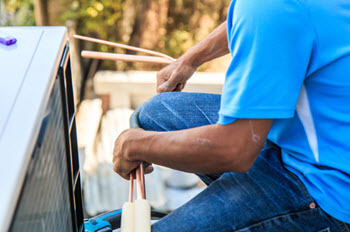 Our highly-trained HVAC techs have the knowledge and the skills to get the job done right, the first time around. If you need an estimate to replace your dated air conditioning unit or to repair it, we can help with that as well. We provide all of the services that your HVAC system needs. This includes air conditioning installation, air conditioning maintenance, and general repairs on your HVAC system. When calling for an appointment, be sure to ask about our free second opinions and free estimates. We will provide you with the best air conditioner replacement cost estimate along with the most affordable central air conditioner prices. You can be sure that we will offer you the best options to suit your needs. You can also be sure that we will complete the work professionally and as quickly as possible. Best of all, we back up our work. We make it a point that all of our customers are satisfied with the service that we provide. To learn more about us or to schedule an appointment, give us a call today. Some of the areas we service include Miami, Miami Beach, North Miami, Kendall and these zip codes: 33101, 33109, 33154, 33143 as well as all surrounding areas in Miami-Dade County, Florida. We service multiple locations throughout the United States, including Miami, FL. Click here to see our coverage area. You can also give us a call at (888) 972-8662 to fast and reliable repairs and maintenance.